Examination Fee Rs.100 should be paid by Demand Draft in favour of "Director, Animal Husbandry and Veterinary Services Chennai 600 006." payable at "Chennai"
Post No.1 to 5 : Selection will be made through on the basis of written examination marks. 50 MCQ time duration one hour. Duly completed application form along with all necessary documents (self attested photocopies and Demand Draft) should be handed over by Post / direct to The Director, Department Animal Husbandry and Veterinary Services, Central Office Buildings, Block II, DMS Complex, Chennai 600 006 on or before 15th September 2015. Check-List / What are documents to be enclosed along with application form? For serial number 1 Post (livestock inspector / veterinary inspector) : selected candidates will be send for 11 months training programme, the scale of pay-salary will be applicable after the training period only. Do not forget to mention the "Post applied for....." in Envelope cover top left corner. For post no.1, Live stock inspector : There is no salary or stipend for 11 months training period. Salary as per Scale of Pay will be start from after the training period only. Higher Qualified candidates also apply for the above postings. (example BE candidates may also apply). If any one wrongly taken Demand Drafts as MEDICAL SERVICES instead of VETERINARY SERVICES, Don't get panic, your demand drafts will be accepted by the department of AHVS. Written examinations will be in the format of Multiple Choice Questions method only (MCQ type). Corrigendum issued for extension of last date from 15th September 2015 to 25th September 2015. Maximum age limit has been relaxed for degree holders for all posts, except Office Asst Post. Maximum age limit has been relaxed for 10th holders for Post No.6 ie Veterinary Assistant Post. Total Number of Posts has been reduced from 1101 to 1089 vacant posts. There no change in Office Assistant Post. is degree eligible for any post? yes...degree holder can apply for it. Where can i find the application in the website ..I've searched under the animal husbandry dept but still missing.pls help me. res., mam/sir there is no application form in the tn.gov.in site, where would to be download the application? No. Print Application mode only available. PG is degree eligible for any post? sir...........!!!! I have completed my MCA degree. Can i apply for the post for Livestock Inspector Grade II ? Application available on Regional Joint director office, Dep. of Animal Husbandry of all District. For post 1,if selected after training only, is salary will provide?.L want to clarify whether its correct or not. As per the advertisement, the scale of pay will be applicable after the successful training only. Can we apply for more than one post? you can apply more than one post. Will the question paper be in tamil or english? What Id proof want for thirunagai? If surgery done in govt hospital they might be issued a certificate. We do hope, any other transgender person may give the proper information. Currently govt uploaded only one application for first post. After monday only we may get exact information about the application form for other posts. Mr Gboobathy boobalan....now all applications are uploaded. Any one tell Polytechnic Diploma is elegible for vetnairy inspector?? So the polytechnic qualification is eligible to apply. If they reject the application, be ready to file a case! Anony....if 12th is basic qualification Diploma (10+3) is equivalent qualification. I am 2014 passed out with one arrear paper. Please upload the link for the post 2. Can I apply for the 1 and 2 post. I m an physics graduate. Hi Subetha Francis and Packya S, now you can dowload application form for all posts...all the best. Thank u. I downloaded the application. Can I apply for more than one post? We can apply this job by downloading application form from this site or that application form should be original ??? res sir what are the documents are to be attached with an application? +2 xerox and community cert., and anything else? any envelope to be want attach? Madam DoB 16.05.1982 Age calculation is 32 year 01 month 15 days completed on 1.7.2014. I am apply the post? What are all the subject to prepare for the exam? 10th Std Science, Zoology, Animal Husbandry related materials...we will upload model questions in http://tnpscquizportal.blogspot.in/ very soon. Examination Fee Rs.100 should be paid by Demand Draft in favour of "Director, Animal Husbandry and Veterinary Services Chennai 600 006." payable at "Chennai" (Today we confirmed this information in Directorate of AHVS, Chennai. pls mention your date of birth. sir i am from Andhra Pradesh.i am doing my B.com 2nd year.Can i appear for post 1(Inspector).will the question paper be in English or Tamil? we can apply for more than one post? If you have eligible qualifications, then you can apply all the posts. Application or notification parunga ..age cut-off potruku ..sorry to say..age calculation kuda neenga panna try pana matingala . If you are in SC / SCA / ST then you are eligible to apply. If you are UR / BC / MBC with PwD / EXSM ; also eligible to apply. As per BC Quota you can not able to apply. (age limit crossed).But in case of PwD / EXSM persons can apply. You can fill it in tamil or english, it is your choice (But english is good choice). enclose self attested documents. 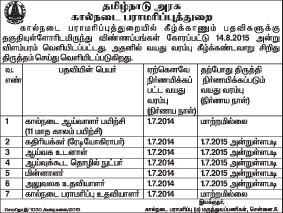 Mam diploma is eligible for veterinary inspector.. If am applying for two posts means I want to take separate DD for each post ah. Please reply me. apply separate forms with separate DD. If am applying for two posts means how can I send the application form. Both the forms in single cover or I want to send separately. No. You should not club more than one application forms in single cover. Send / Handover the application form for each posts separately. Don't forget to mention " Post applied for .........". That's upto your choice... Both are correct. The link, given above is working if you are unable to download the application form, please mention here your email id.. we'll send the application form to you. Applications are available in department of animal husbandry offices. Alternatively you can download the application forms through online. Download link has been provided above. I have completed engineering ,can I apply for this job? yes...you can apply...but try to get engg subject jobs.. Please send the application for the post of Veterinary Inspector and also sent the model question paper to my mail (kuttyrithu@gmail.com). Hi sureshkumar, application form has been sent through your email id. kindly check it. Yes...you should pay the fee. Weather exam conduct in Tamil or English mam? Where can i get model question paper? mam plz send application form for livestock inspector., and if you had model question paper also to my mail id is "kumarkpradeep@live.com"
thank you mam...am received mail and application. You should enclose all necessary documents (pl see the check-list details in above) with your application form, duly self attested. If you are in Chennai you can handover directly. You can send by courier also, but best choice is Regd Post with AD method. What's are copies have to self attested? Mam what is the nature of job office assistant and lab assistant. And whether the question paper will be in english or tamil. And then the application forms will be sent only by post or by courier also. Please reply me mam. 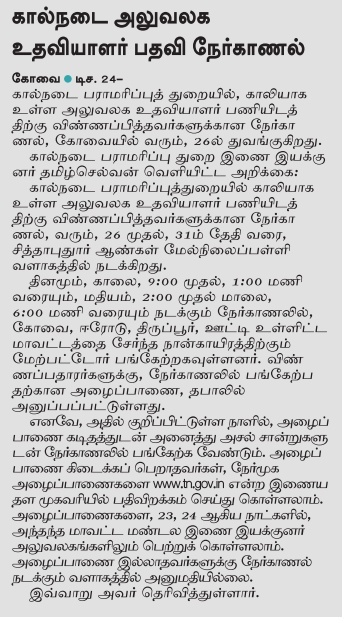 Question paper will be in Tamil or Tamil&English format. Filled applications to be handed-over directly or Post to the Chennai office only. Best choice is send by Regd post with AD. Before send keep one set xerox for your reference. OA is meant for administrative works...LA meant for assistant works in laboratory. Age relaxation is applicable or not? Clearly mentioned in above notification. please check. Still if you have doubts....ask me. Yes...DD should be in the name of "Director, Animal Husbandry and Veterinary Services Chennai 600 006". Please try to change the DD in the bank. If not possible means...cancel the DD and take the new one with correct name. madam, could you please reply for question... and what is different between that two services..
No problem. your DD will be accepted. Have to put sign in backside of DD? There is no online application process for this job postings. You have to download the application form from the above given link. They will give training only for the shortlisted candidates. So, job is sure. But no salary for 11 months. Dear Friends, Today Department of Animal Husbandry and Veterinary Service has been given press notification regarding AGE LIMIT. we have updated above. kindly note it. Correct terminology is Veterinary Services...is used for animal husbandry. "Medical Services" term should not be used in animal husbandry. Medical services word can be used for human care statements..Hence, AHVS is right. Do we have to fill the hall ticket form (which is given with this application) and attach alongside with this application. I have completed engineering ..can I apply for this job? This post will be permanent after 11 month training period. There is no salary or stipend while in the training period of 11 months. what kind of job nature in the post of vet asst . basic care take work in AHVS farms / labs etc. Where did you get the application? directly from the office? or download from net. I think hall ticket portion is not available in net downloadable form. Govt has uploaded hall ticket enclosure (revised form) on 20th eve or 21st morning only. 14th Aug to 19th Aug they are provided application form without hall ticket only. Hence, they must accept all the application forms. Don't get panic. Do you really wants to STOP www.tngovernmentjobs.in service? please wait we will give proper answer for your question on monday evening. Do not panic.. Basic Qualification for Post No.1 is 12th Std Pass. So you can apply for this post. Can we take DD from any nationalised bank or any specific bank is there Admin? You can take the Demand Draft any one nationalised bank in India. But it should be payable as in "Chennai"
Basic qualification for post no.7 (Veterinary Assistant) is 8th Std Pass or Fail. If you are having more qualifications...there is no problem to apply these post. hai mam i was download application on net .I have to fill the hall ticket and attach alongside with this application. livestock inspector grade II mam and my sister completed for bsc physics will appply radiographer post give preference mam. kindly clarify whether inter cost marrage candidates will pay exam fees pls reply..
we want to fill the hall ticket ? Dear madam/sir, I need the clarification for post 1 is the job permanent ? . nature of the job. Area vise Vacancy's. Is there any short list after training period. Dear Mr Ranga Raj.....be cool first. It is not our mistake. We are clearly mentioned the URL file path...which is provided by Government of Tamilnadu. 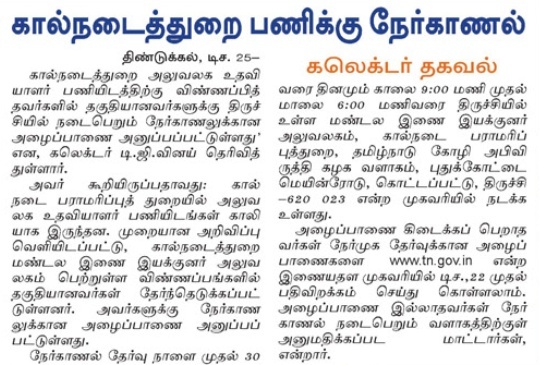 While advertisement published in daily thanthi news paper there is no application form issued by govt in website. 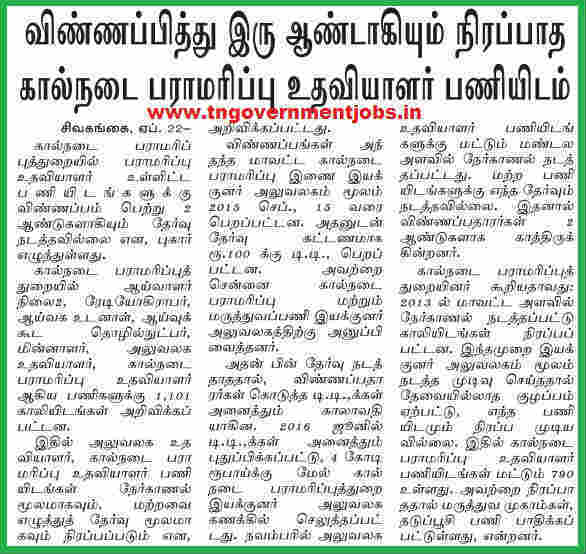 On 15th August 2015 tn.gov.in website uploaded only one application that is livestock inspector post. Till that date, there is no application uploaded by govt. Monday onwards they uploaded remaining applications, which we are given as it is (web url) without any modification. In that application form they are not given any hall ticket form attachments. (Please check that URL still working and they did not de-activate it). Recently govt has been modified the application format that means they added hall ticket attachment. If they modified the application form they should give information about the changes in application form. Till today they are not given corrigendum regarding this. I think they will accept the application which are not enclosed the hall ticket. We will contact them on monday, and give the solution for this matter. We do hope your application will be accepted by them. hello mam, when will they conduct the exam ? Hai madam.. Am applied livestock inspector grade 2 and posted director office madam.. But last two days before new applications form update panni irukkanga madam..Naan anupuna old application forms hall ticket form ella madam.. New VA update panna application forms la hall ticket form irukku madam.. So Naan anupuna old application forms hall ticket form ella madam.. Eppo Naan yenna panrathu madam? 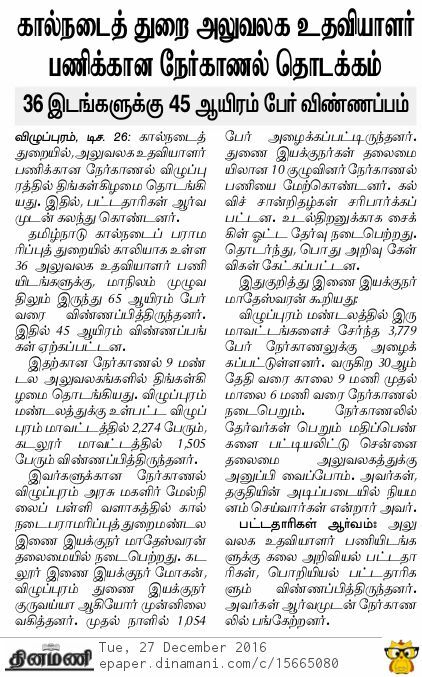 Naan again application anuppunuma madam tell me..
yes.. now only get the information about it. Now we updated new application forms. Be cool. we will give the reply for this matter on monday evening. What will be the salary for the veterinary inspector post while the training period and after. No salary or No stipend in 11 months training period. Scale of Pay salary will start from after training period only.